A video, and some pictures taken at an electronics fair in Hong Kong, show off a mock up of the Apple iPhone 6. Although what we are looking at is nothing more than a slab of metal, we can see the outline of the larger screen and the rounded corners. The early buzz is that the next iteration of the iPhone will take its design cues from the Apple iPad Air, and the Apple iPad mini with Retina display. 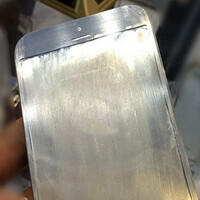 Earlier, there was speculation that the phone would be just 6mm thick and named the Apple iPhone Air.